Four underground mega-cities make-up the nation of Quatus. Drow, duergar, and svirfneblin work together to fight a threat pressing upon their gates and looming large in the tunnels outside their cities. Constant stress and violence has taught Quatus’ citizens to be alert, proactive, and ready to strike. That same stress has also brought the citizens of Quatus together like nowhere else. No group of humanoids is more loyal to one another than the citizens of Quatus. They embody patriotism. 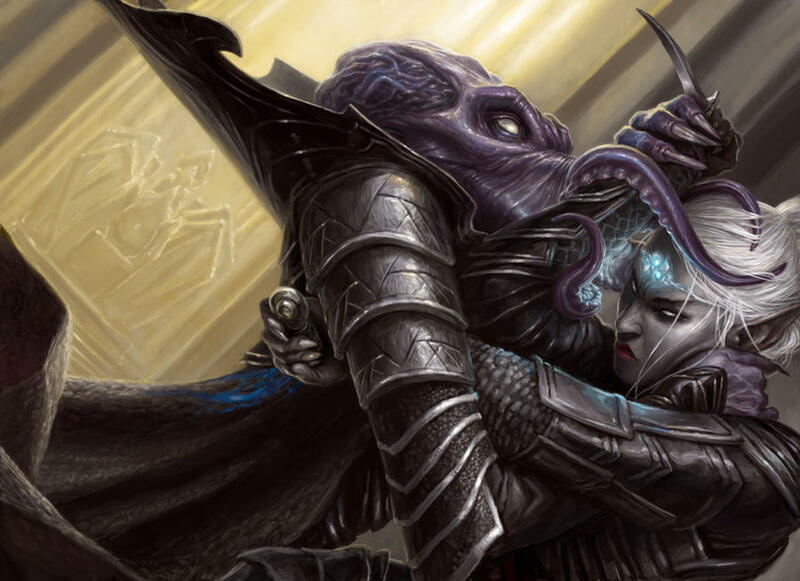 You never want to be this close to a mind flayer if you can avoid it. Years ago, the aberrants of West Canus were driven deep underground by chromatic dragons and shardminds. Weakened and small in number, the aberrants hid and licked their wounds, growing their ranks and preparing to once again take Canus for themselves. During this time they took note of the ten glorious Underdark cities of the drow, duergar, and svirfneblin. These aberrants decide the surface world was no longer the place to make a home and instead set their sights on The Underdark. For thousands of years the rested and then struck with a fury against the ill prepared cities. After years of war and struggle, and the loss of half their population when many war-weary drow and svirfneblin headed to the surface, the Underdark humanoids only have four fortified cities that have not fallen to the aberrants. The citizens of these cities know well the danger lurking just outside the gates. Each city has only a few heavily guarded entry points. The only way to get to these points is via narrow tunnels with gates every fifty feet. The narrow tunnels and checkpoints bottleneck traffic into the cities. If an aberrant attack occurs the gates are slammed down isolating the incident. The folk trapped inside with the beasts are left to fend for themselves until crossbow wielding guards make an appearance and shoot at the monsters through the bars of the gate. Needless to say, waiting in line to get into a city is a tense experience. Inside of a Quatus city, every citizen is armed. Though it is a rare occurrence, the aberrants will sometimes burrow through the floor, walls, or ceiling of a city and attack. Since all drow, duergar, and svirfneblin spend a decade or more in the military after coming of age, the populous is an accomplished army, ready for action. The people of Quatus are fiercely loyal to one another since they are all brothers and sisters in arms. The people of Quatus have more enemies than just the aberrants against whom to rally. Don’t mess with the drow. They have pets. If fighting the aberrants is about survival, than fighting the elves is about vengeance. When the elves left the drow millennia ago an incurable divide formed between the two groups. Since then the drow have performed many violent surgical strikes against critical elf targets. The most infamous of these strikes being The Arachna War. 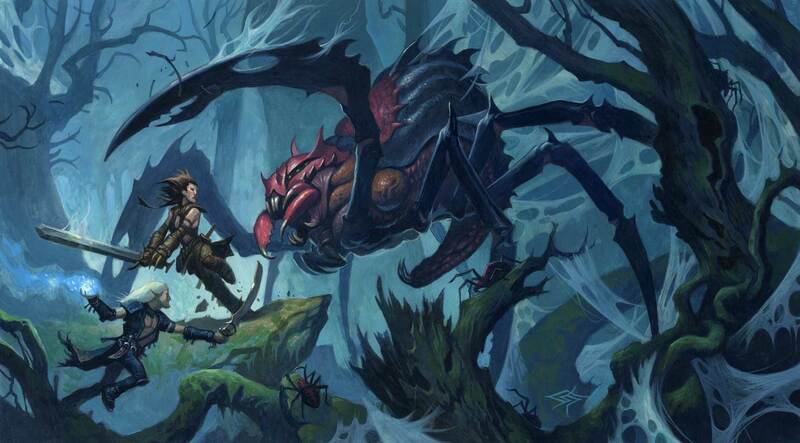 The Arachna War was a period of time which came after Quantian spies placed giant spider eggs all over Taliana. Eventually these eggs hatched releasing an army of huge vermin that terrorized Taliana’s population. Eventually, these spiders were mostly defeated with the help of The Arcane College, but some of these beasts still stalk Taliana’s forests. Today, the tactics of the Quantians concerning the elves is to strike when they are least expected. Sometimes they strike large groups of elves at a joyous public gathering. Other times they may steal an object of importance or deface a monument. Sometimes they may assassinate an important target. They may poison wells or spread disease or hatch another scheme. Their goal concerning the elves is to make their existence on the surface so unbearable that they return to their brethren of The Underdark. Each of Quatus four cities is run by an all-powerful General King. Martial law is the only law in Quatus. The General Kings have officers answerable to them and communicate with the leaders of other cities daily through crystal balls and in-person meetings via teleportation circle. All General Kings are drow. Any major decisions involving Quatus they make together. They will only enact policy with a unanimous vote, so their talk and debates can take a long time. For the most part the General Kings leave the day-to-day running of their cities to their officers and focus in the big picture – the war with the aberrants and the war with the elves. Officers treat all non-military citizens as privates. They give orders which must be obeyed for security and survival. Very little is private in Quatus. The military has access to any documents, information, and history for which it asks its citizens. Those who do not comply are tortured and threatened as necessary. This is not often though, for the people of Quatus are Exploration Age’s most patriotic and are willing to give up privacy for security in a moment’s notice. At least the view is decent! Life in Quatus is full of extreme highs and lows. The drow believe every second they are alive is a moment to have joy and so they push those boundaries by partying hard and enjoying the fruits of life while they can. Duergar take tremendous pleasure in their work and crafts while deep gnomes get joy from time spent with family and friends. Still on any given day, a friend may fall in the tunnels or on a mission to the surface. Funerals are quick and constant in Quatus. The folk of Quatus usually enjoy simple, hearty meals made up of various mushrooms, root vegetables, and underground varieties of pork or beef. Their art and architecture has a classical feel – beautiful marble statues, paintings, mosaics, monuments, and buildings stand as testaments to great heroes and those who have fallen in battle. Quatus’ biggest export to the nations of the surface are precious gemstones. These are valuable because they are often components for vehicles and equipment that run on magic. Of course mining has its dangers in the tunnels, but for every miner there are two soldiers within the tunnels, ever vigilant for the aberrant threat. The gems are expensive, because trips to the surface are fraught with perils. Likewise, travelers do make their way to Quatus, though not often. The citizens are naturally suspicious of outsiders and the journey from the surface is dangerous. Only the richest merchants can hire enough well-trained guards or afford the teleport to make it to Quatus alive. The military leaders of Quatus know some secret tunnels that can get them to surface quickly for performing raids on Taliana but they do not share them with anyone they don’t trust, as those tunnels could be used against them. This phrasing makes me uncomfortable. Was that an intentional allusion to the US? Other than that I love that all the Underdark races are united and the Drow aren’t generic “bad guys” as a whole. Just don’t forget for your pdf you can’t talk about “mind flayers” or “illithids”. It wasn’t meant to be an allusion to the US. I actually think of Americans as pretty divided on the issue. It is a thought certainly inspired by that debate, but I’m not trying to make a statement or make folks uncomfortable. I’ll adjust that! 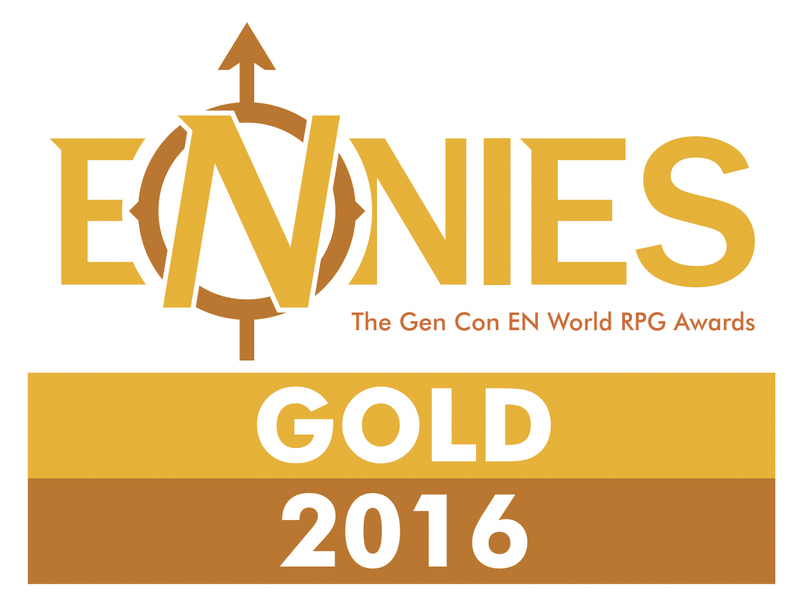 The illithids will not be in the PDF but they will be in the blog! So interesting to read about a Drow that are so different from the dark elves we’re used to. Embracing joy? Partying? INCONCEIVABLE!